My teaching philosophy is founded on the theories of Paulo Freire, Jane Addams of the Hull House and John Dewey and my ancestors. I believe in creating a teaching environment that is safe, interactive, and collaborative, promotes problem-solving and critical thinking skills. I believe in creating a welcoming environment that accommodates a variety of intelligences and learning styles and encourages students to present their opinions while respecting the opinions of others. I strive to give students “voice” in my classes; not only do the students benefit from peer-peer learning by enriching the course material with personal experiences and knowledge, but also take responsibility for their own learning; therefore, enhancing the integration of their new knowledge into practice. Promoting independent thinking is essential so that students can take what they have learned and apply it in real-life situations. Therefore, I endeavor to make my classroom a sphere for students to learn skills and demonstrate outcomes. To create a safe learning environment, I encourage students to ask questions and give their views on the material we are covering. I challenge them to look at opposing view- points, and also clarify their own ideas and back them with sound research. I create assignments that improve students’ problem solving and critical thinking skills, such as analyzing psychological theories embedded in media for teaching students and adults and for changing or enhancing behavior. I utilize small-group discussions both to actively involve the students in their own learning as well as to improve their critical thinking skills. In order to achieve the ultimate goal of student learning, I strive to implement strategies that create a collaborative and safe atmosphere and encourage the application of knowledge to new situations. I believe that these strategies help students become ready and able to utilize their knowledge in their studies and in their future employment. Dolapo Adeniji-Neill & Anne Mungai (Eds). (2016). Written in Her Own Voice: Ethno-educational Autobiographies of Women in Education. New York, Bern, Berlin, Bruxelles, Frankfurt am Main, Oxford, Wien,: Peter Lang. Van Wyk, Berte & Adeniji-Neill, Dolapo (Eds). (2014). Indigenous concepts in education: Towards elevating humanity for all learners. New York, NY: Palgrave-Macmillan. Adeniji-Neill, Dolapo (2009). Shamelessly Beautiful Morning. Thorofare, NJ: Xlibris Corporation. Adeniji-Neill, Dolapo (2009). The Yoruba Oral Culture as Indigenous Education: Praise Poetry, Folktales and Folklore. Saurbrucken, Germany: Lambert Academic Publishing, AG & Co..
Adeniji-Neill, Dolapo (2008). Parental Expectations in Education: A Case Study of Nigerian Immigrant Parents to the United States. Saurbrucken, Germany: VDM Verlag Dr. Muller Aktiengesellschaft & Co. KG. Adeniji-Neill, D., Gibney, T., & Weida, C. (2014). Craft objects, folklore, and storytelling. In Weida, C. (Eds.). Crafting Creativity & Creating Craft: Craftivism, Art Education, and Contemporary Craft Culture. Netherlands: Sense Publishing. Netherlands..
Dolapo Adeniji-Neill, Courtney Lee Weida, & Anne Mungai (2018).Hybrid, Hybrid Flexible, and Fully Online Learning Through Students' Eyes.The Journal of Social Sciences. ISSN 1549-3652 (Print) ISSN: 1558-6987 9online). DOI: 10.3844/jssp.2018. Dolapo Adeniji-Neill & Berte van Wyk (2016), Community Schools and Society: An Analysis of Curriculum Conflict and Resolutions through South Africa's and United States’ Perspectives. The International Journal of Community Diversity, Volume 16, Issue 2, 1-10. Dolapo Adeniji-Neill (2014), When elephants fight, the grass gets trampled: Internal displacements of women and its educational implications. The International Journal of Diversity in Education, 13, 2, 78-88. Dolapo Adeniji-Neill (2012), Failure Is Not An Option: Parental Expectations Of Nigerian Voluntary Immigrants to the United States. Ethnicity and Race in a Changing World: A Review Journal. Dolapo Adeniji-Neill (2012), Diaspora Fathers Speak: Looking back to move forward: African Fathers’ views of the cultural and educational dimensions of fatherhood. The International Journal of Diversity in Organisations, Communities and Nations, 11, 15. Dolapo Adeniji-Neill (2012), Omoluabi: The way of human being: An African philosophy's impact on Nigerian voluntary immigrants' educational and other life aspirations. Ìrìnkèrindò: a Journal of African Migration, 5, 17. Dolapo Adeniji-Neill (2012), Creating New Spaces for Learning: Fostering Experiential and Service Learning in a 9-12 School, Journeys Through the African American Past. Journal of Social Sciences. Science Publications., 8, 202-206. Dolapo Adeniji-Neill (2011), African women's education and empowerment: Case studies of Nigerian women resident in Egypt. The International Journal of Interdisciplinary Social Sciences, 5, 16. Dolapo Adeniji-Neill, (2018). Hybrid, Hybrid Flexible and Fully Online Learning Through Student's Eyes in Fourteenth International Conference on Technology & Society:Regeneration, Authonomy, and Sustainability-Productive Technologies and the Green Economy. St. John's University, Manhattan Campus, New York, USA. Dolapo Adeniji-Neill (2018). Homage to Orisha: Artistic Expressions and the Healing , and Educative Powers of a Yoruba Women's Poetry and Incantations in the 16th Annual Hawaii International Conference on Education. Honolulu, Hawaii. Dolapo Adeniji-Neill (2017). Women in Society,Education and Empowered in African Context in the WEI International Acedemic Conference in Rome 2017. Rome. Dolapo Adeniji-Neill (2017). Communal and Tributary formations: The Yourba Expertence in the Tenth Global Studies Conference and Global Studies Research Network. Singapore. Dolapo Adeniji-Neill(2016).A Gift from the Yoruba Trickster: Culturally Relevant Teaching in the Age of Globalization. In International Conference on Urban Education, 2016 ICUE program.. San Juan, Puerto Rico. Dolapo Adeniji-Neill (2016). A Gift of the Yoruba Trickster: Teaching Multiculturally in the Age of Globalization. In Hawaii International conference on Education, 14th Annual Conference (pp. 18). Honolulu, Honolulu, Hawaii. 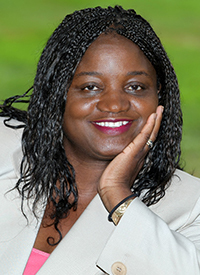 Dolapo Adeniji-Neill (2015). Transforming School Climate To Improve Students' Lives: An Urban School Students' Solutions. In Hawaii International Conference On Education 13th Annual Conference (pp. 15). Oahu, Honolulu, Hawaii. Dolapo Adeniji-Neill, Anne Mungai, & Srilata Bhattacharyya (2014). Transforming School Cultures To Improve Students' Lives: An Urban School Students' Solutions. In International Conference on Urban Education (ICUE). Montego Bay, Montego Bay, Jamaica. Adeniji-Neill, D., Mungai, A (2014). Written in Her Own Voice: Excavating Our Pasts, Auto-Ethno-Edu-Biographies of Ten Women in Higher Education. In 14th International Conference on Diversity in Organizations, Communities, and Nations. ). Vienna University of Economics and Business. Institute for Gender and Diversity In Organizations. Vienna, Vienna, Austria. Dolapo Adeniji-Neill (2014). Haiti After the Quake: Poverty and Nation Building Through Images, Dreams of the Future and Realities. In 12th. Annual Hawaii International conference on Education (pp. 16). Oahu, Honolulu, Hawaii. Dolapo Adeniji-Neill, Courtney Lee Weida, Tara Gibney (2013). Weaving Threads of Narrative and Aesthtics: Interdisciplinary Education through Story Telling Approaches. In 14th International Conference on Diversity in Organizations, Communities, and Nations (pp. 15). Casuarina NT, Darwin, Australia. Dolapo Adeniji-Neill (2013). When Elephants fight, the Grass Gets Trampeled: Internal Displacement of Women and Its Educational Implications. In 14th International Conference on Diversity in Organizations, Communities, and Nations (pp. 15). Charles Darwin University, Casuarina NT, Darwin, Australia. Dolapo Adeniji-Neill (2013). A Qualitative Inguiry Into the Virtual Interaction of Student in Asynchronous Online Blended Courses. In 15th annual International Conference on Education (pp. 20). Athens, Greece. Dolapo Adeniji-Neill (2012). I will chant homage to the Orisha: The role of folklore, folktales and praise songs in Yoruba culture. In Twelfth International Conference on Diversity in Organisations, Communities and Nations. (pp. 22). Virtual Presentation, Vancouver, Canada. Dolapo Adeniji-Neill (2012). “When Elephants fight, the grass gets trampled”: The internal displacement of women and its educational implications. In Seventh International Conference on Interdisciplinary Social Sciences. (pp. 18). Universidad Abat Oliba CEU, Barcelona,Spain. Dolapo Adeniji-Neill and Berte van Wyk (2012). “To know is not enough:” Diaspora fathers conduct of fatherhood, teaching and learning with their children in a new world. In American Educational Research Association (AERA) (pp. 15). Vancouver, Canada, Vancouver, Canada. Berte van Wyk and Dolapo Adeniji-Neill (2011). Community Schools and Society: An analysis of Curriculum Conflict and Resolution Through South Africa and United States perspectives. In International Conference on Education (ICE), (pp. 16). Samos, Greece. Dolapo Adeniji-Neill (2011). Creating New Spaces for Learning: Fostering Experiential and Service Learning In a 9-12 Grade School, Journeys Through African American Past. In International Conference on Education (ICE) (pp. 16). Samos, Greece. Dolapo Adeniji-Neill (2011). Diaspora Fathers Speak: Looking Back to Move Forward, African Fathers’ Views of the Cultural and Educational Dimensions of Fatherhood. In 11th International Conference on Diversity in Organisations, Communities and Nations. (pp. 22). South Africa (Virtual Presentation). Dolapo Adeniji-Neill (2011). Omoluabi: “The way of human being:” An African philosophy’s impact on Nigerian voluntary immigrants’ educational and other life aspirations. In American Educational Research Association (pp. 27). New Orleans,Los Angeles. Dolapo Adeniji-Neill (2010). Omoluabi: The way of human being: Does it make a difference in a student's life? In Hawaii Educational Research Association. Honolulu, Hawaii. Dolapo Adeniji-Neill (2009). African women’s education and empowerment: Case studies of Nigerian women resident in Egypt. In 5th. International Conference on Interdisciplinary Social Sciences. (pp. 16). Murray Edward College, Cambridge, England. Adeniji-Neill, Dolapo (2008). Parental Expectations in Education: A Qualitative Study of Expectations of Nigerian Voluntary Immigrants to the United States for their Children’s School Achievement. In Hawaii Educational Research Association. Honolulu, Hawaii. Dolapo Adeniji-Neill (2016, March). The James Baldwin Lecture on Literary and Social Criticism: Mirrors of Minds: Images of Internally Displaced African Women through Biographies and Poetry. African, Black and Caribbean Studies Center, Adelphi University, Garden City, NY. Dolapo Adeniji-Neill (2014, November). Literature and the Human Condition: Little Bee. School of Social Work, Adelphi University, Garden City, NY. Dolapo Adeniji-Neill (2014, February). Eileen the Christmas Tree. Africa American Read Aloud-In 2014. Adelphi University Center for Africa, Black & Caribbean Studies, Garden City, NY. Dolapo Adeniji-Neill (2013, November). “Written In Her Own Voice.”. Kappa Delta Pi Honor Society. Adelphi University, Garden City, NY. Dolapo Adeniji-Neill (2013, February). “Shamelessly Beautiful Morning.”. African American Read- In 2013. Celebrating Identity. Reading Aloud The Literary Works of Black Writers. Center for African, Black Caribbean Studies Adelphi University, Garden City, NY. Dolapo Adeniji-Neill (2012, March). Promoting Capacity Through Cooperation Between Urban & Rural Women. 56th Session of the United Nations Commission on the Status of Women (African Women Alliance, Inc.), New York, NY. Dolapo Adeniji-Neill (2011, November). Things Fall Apart. Literature and the Human Condition, No. 38. Part of the Adelphi University International Education week. (Panel Discussion). Adelphi University School of Social Work, Garden City, NY. National Council for the Social Studies (NCSS). Northeast Regional Conference on the Social Studies.